The New Scorpion mains cable utilises 32 x Hybrid Core Technology high purity oxygen free copper conductors . The HCT drastically minimises the skin effect problem of most stranded conductors and provides the highest quality signal integrity. We then use a Low Density Polyethylene dielectric to make the lowest resistance possible. The individually coated and insulated conductors are then arranged in twin helical spirals each consisting of 4 groups of 4 HCT conductors with each group being separately screened with a floating conductive carbon tube (CCT) to ensure no unwanted interference is picked up, the screen is terminated with a 4mm socket to allow connection to our energy removal system (ERS) to ensure minimal interference with the conductors. This is designed to drastically reduce RF (radio frequency) and EM (electro magnetic) interference. All our customers who have try them on AV systems say the New Scorpion really brings colours to life when attached to any visual products with greater contrast and crisper on screen text, the colour balance appears to be very natural and blacks very deep. 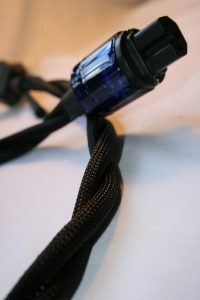 The Scorpion mains cable is terminated as standard with an oem Version of the MS HD power 1363 UK Plug . You then have the choice between a Rhodium/ Platinum plated copper 10amp IEC or a 16amp High Current IEC. We are also now able to fit a high quality gold plated 2 pin figure 8 plug for increased compatibility.